Sunshine Lake Pharma Co., Ltd. Proprietary Name: Metformin Hydrochloride What is the Proprietary Name? Non-Proprietary Name: Metformin Hydrochloride What is the Non-Proprietary Name? 48792 - Sunshine Lake Pharma Co., Ltd.
Metformin Hydrochloride with NDC 48792-7861 is a a human prescription drug product labeled by Sunshine Lake Pharma Co., Ltd.. The generic name of Metformin Hydrochloride is metformin hydrochloride. The product's dosage form is tablet, film coated and is administered via oral form. Labeler Name: Sunshine Lake Pharma Co., Ltd.
FDA Application Number: ANDA208999 What is the FDA Application Number? Metformin Hydrochloride Tablets, USP are indicated as an adjunct to diet and exercise to improve glycemic control in adults and pediatric patients 10 years of age and older with type 2 diabetes mellitus. The recommended starting dose of metformin hydrochloride tablets is 500 mg orally twice a day or 850 mg once a day, given with meals.Increase the dose in increments of 500 mg weekly or 850 mg every 2 weeks on the basis of glycemic control and tolerability, up to a maximum dose of 2,550 mg per day, given in divided doses.Doses above 2,000 mg may be better tolerated given 3 times a day with meals. The recommended starting dose of metformin hydrochloride tablets for pediatric patients 10 years of age and older is 500 mg orally twice a day, given with meals.Increase dosage in increments of 500 mg weekly on the basis of glycemic control and tolerability, up to a maximum of 2,000 mg per day, given in divided doses twice daily. Metformin Hydrochloride Tablets, USP are available as:Tablets: 500 mg white or almost white round film-coated tablets, debossed "L34" on one side and blank on the other side. Tablets: 850 mg white or almost white capsular film-coated tablets, debossed "S99" on one side and blank on the other side. Tablets: 1,000 mg white or almost white capsular film-coated tablets, debossed "S98" on one side and blank on the other side, and scored the bisect line on both sides. Manufactured by:Sunshine Lake Pharma Co., Ltd. Manufactured for:HEC Pharm USA Inc. PATIENT INFORMATION METFORMIN HYDROCHLORIDE [met-FAWR-min HYE-droe-KLOR-ide] Tablets, USPRead the Patient Information that comes with metformin hydrochloride tablets before you start taking it and each time you get a refill. There may be new information. This leaflet does not take the place of talking with your healthcare provider about your medical condition or treatment. What is the most important information I should know about metformin hydrochloride tablets?Serious side effects can happen in people taking metformin hydrochloride tablets, including:Lactic Acidosis. Metformin hydrochloride, the medicine in metformin hydrochloride tablets, can cause a rare, but serious, side effect called lactic acidosis (a build-up of lactic acid in the blood) that can cause death. Lactic acidosis is a medical emergency and must be treated in a hospital. “What is the most important information I should know about metformin hydrochloride tablets?”What should I tell my healthcare provider before taking metformin hydrochloride tablets?Before taking metformin hydrochloride tablets, tell your healthcare provider if you:have type 1 diabetes. 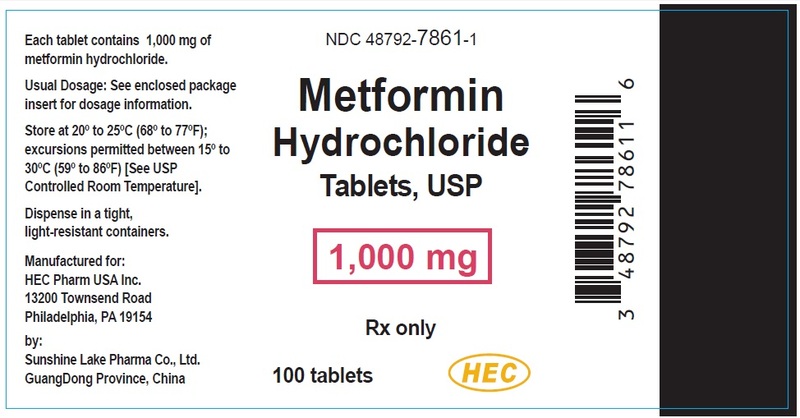 Metformin hydrochloride tablets should not be used to treat people with type 1 diabetes.have a history or risk for diabetic ketoacidosis (high levels of certain acids, known as ketones, in the blood or urine). Metformin hydrochloride tablets should not be used for the treatment of diabetic ketoacidosis.have kidney problems.have liver problems.have heart problems, including congestive heart failure.are older than 80 years. If you are over 80 years old you should not take metformin hydrochloride tablets unless your kidneys have been checked and they are normal.drink alcohol very often, or drink a lot of alcohol in short-term “binge” drinking.are taking insulin.have any other medical conditions.are pregnant or plan to become pregnant. It is not known if metformin hydrochloride tablets will harm your unborn baby. If you are pregnant, talk with your healthcare provider about the best way to control your blood sugar while you are pregnant.are breast-feeding or plan to breast-feed. It is not known if metformin hydrochloride tablets passes into your breast milk. Talk with your healthcare provider about the best way to feed your baby while you take metformin hydrochloride tablets.Tell your healthcare provider about all the medicines you take, including prescription and nonprescription medicines, vitamins, and herbal supplements. Know the medicines you take. Keep a list of them to show your healthcare provider and pharmacist when you get a new medicine. ​Metformin hydrochloride tablets may affect the way other medicines work, and other medicines may affect how metformin hydrochloride tablets works. Can metformin hydrochloride tablets be used in children?Metformin hydrochloride tablets have been shown to effectively lower glucose levels in children (ages 10-16 years) with type 2 diabetes. Metformin hydrochloride tablets have not been studied in children younger than 10 years old. Metformin hydrochloride tablets have not been studied in combination with other oral glucose-control medicines or insulin in children. If you have any questions about the use of metformin hydrochloride tablets in children, talk with your doctor or other healthcare provider.How should I take metformin hydrochloride tablets?Take metformin hydrochloride tablets exactly as your healthcare provider tells you.Metformin hydrochloride tablets should be taken with meals to help lessen an upset stomach side effect.Swallow metformin hydrochloride tablets whole.You may sometimes pass a soft mass in your stools (bowel movement) that looks like metformin hydrochloride tablets tablets.When your body is under some types of stress, such as fever, trauma (such as a car accident), infection, or surgery, the amount of diabetes medicine that you need may change. Tell your healthcare provider right away if you have any of these problems.Your healthcare provider should do blood tests to check how well your kidneys are working before and during your treatment with metformin hydrochloride tablets.Your healthcare provider will check your diabetes with regular blood tests, including your blood sugar levels and your hemoglobin A1C.Follow your healthcare provider’s instructions for treating blood sugar that is too low (hypoglycemia). Talk to your healthcare provider if low blood sugar is a problem for you. See “What are the possible side effects of metformin hydrochloride tablets?”Check your blood sugar as your healthcare provider tells you to.Stay on your prescribed diet and exercise program while taking metformin hydrochloride tablets.If you miss a dose of metformin hydrochloride tablets, take your next dose as prescribed unless your healthcare provider tells you differently. Do not take an extra dose the next day.If you take too much metformin hydrochloride tablets, call your healthcare provider, local Poison Control Center, or go to the nearest hospital emergency room right away.What should I avoid while taking metformin hydrochloride tablets?Do not drink a lot of alcoholic drinks while taking metformin hydrochloride tablets. This means you should not binge drink for short periods, and you should not drink a lot of alcohol on a regular basis. Alcohol can increase the chance of getting lactic acidosis.What are the side effects of metformin hydrochloride tablets?Lactic acidosis. Metformin, the active ingredient in metformin hydrochloride tablets, can cause a rare but serious condition called lactic acidosis (a buildup of an acid in the blood) that can cause death. Lactic acidosis is a medical emergency and must be treated in the hospital. Call your doctor right away if you have any of the following symptoms, which could be signs of lactic acidosis:you feel cold in your hands or feetyou feel dizzy or lightheadedyou have a slow or irregular heartbeatyou feel very weak or tiredyou have trouble breathingyou feel sleepy or drowsyyou have stomach pains, nausea or vomitingMost people who have had lactic acidosis with metformin have other things that, combined with the metformin, led to the lactic acidosis. Tell your doctor if you have any of the following, because you have a higher chance for getting lactic acidosis with metformin hydrochloride tablets if you:have severe kidney problems, or your kidneys are affected by certain x-ray tests that use injectable dyehave liver problemsdrink alcohol very often, or drink a lot of alcohol in short-term "binge" drinkingget dehydrated (lose a large amount of body fluids). This can happen if you are sick with a fever, vomiting, or diarrhea. Dehydration can also happen when you sweat a lot with activity or exercise and do not drink enough fluidshave surgeryhave a heart attack, severe infection, or strokeCommon side effects of metformin hydrochloride tablets include diarrhea, nausea, and upset stomach. These side effects generally go away after you take the medicine for a while. Taking your medicine with meals can help reduce these side effects. Tell your doctor if the side effects bother you a lot, last for more than a few weeks, come back after they’ve gone away, or start later in therapy. You may need a lower dose or need to stop taking the medicine for a short period or for good. About 3 out of every 100 people who take metformin hydrochloride tablets have an unpleasant metallic taste when they start taking the medicine. It lasts for a short time. Metformin hydrochloride tablets rarely cause hypoglycemia (low blood sugar) by themselves. However, hypoglycemia can happen if you do not eat enough, if you drink alcohol, or if you take other medicines to lower blood sugar.How should I store metformin hydrochloride tablets? Store metformin hydrochloride tablets at 68°F to 77°F (20°C to 25°C). If you have questions or problems, talk with your doctor or other healthcare provider. You can ask your doctor or pharmacist for the information about metformin hydrochloride tablets that is written for healthcare professionals. Medicines are sometimes prescribed for purposes other than those listed in a patient information leaflet. Do not use metformin hydrochloride tablets for a condition for which it was not prescribed. Do not share your medicine with other people. What are the ingredients of metformin hydrochloride tablets?Active ingredients of metformin hydrochloride tablets: metformin hydrochloride.Inactive ingredients in each tablet of metformin hydrochloride tablets: povidone and magnesium stearate. In addition, the coating for the 500 mg, 850 mg and 1000 mg tablets contains hypromellose, titanium dioxide and polyethylene glycol.What is type 2 diabetes? Type 2 diabetes is a condition in which your body does not make enough insulin, and the insulin that your body produces does not work as well as it should. Your body can also make too much sugar. When this happens, sugar (glucose) builds up in the blood. This can lead to serious medical problems. The main goal of treating diabetes is to lower your blood sugar to a normal level.High blood sugar can be lowered by diet and exercise, and by certain medicines when necessary.Talk to your healthcare provider about how to prevent, recognize, and take care of low blood sugar (hypoglycemia), high blood sugar (hyperglycemia), and problems you have because of your diabetes. Rev July 2018This Patient Information has been approved by the U.S. Food and Drug Administration. 2, assess the benefit risk of continuing therapy. 2; in patients with a history of liver disease, alcoholism, or heart failure; or in patients who will be administered intra-arterial iodinated contrast. Re-evaluate eGFR 48 hours after the imaging procedure; restart metformin hydrochloride tablets if renal function is stable. There have been postmarketing cases of metformin-associated lactic acidosis, including fatal cases. These cases had a subtle onset and were accompanied by nonspecific symptoms such as malaise, myalgias, abdominal pain, respiratory distress, or increased somnolence; however, hypotension and resistant bradyarrhythmias have occurred with severe acidosis. Metformin-associated lactic acidosis was characterized by elevated blood lactate concentrations (>5 mmol/L), anion gap acidosis (without evidence of ketonuria or ketonemia), and an increased lactate: pyruvate ratio; metformin plasma levels were generally >5 mcg/mL. Metformin decreases liver uptake of lactate increasing lactate blood levels which may increase the risk of lactic acidosis, especially in patients at risk.If metformin-associated lactic acidosis is suspected, general supportive measures should be instituted promptly in a hospital setting, along with immediate discontinuation of metformin hydrochloride tablets. 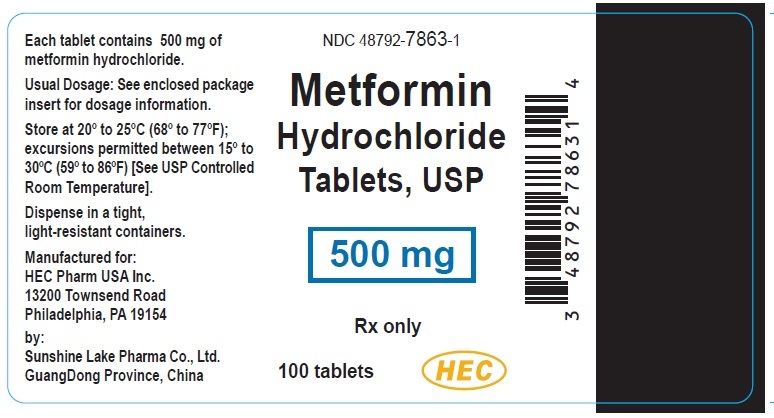 In metformin hydrochloride tablets treated patients with a diagnosis or strong suspicion of lactic acidosis, prompt hemodialysis is recommended to correct the acidosis and remove accumulated metformin (metformin hydrochloride is dialyzable with a clearance of up to 170 mL/min under good hemodynamic conditions). Hemodialysis has often resulted in reversal of symptoms and recovery. Educate patients and their families about the symptoms of lactic acidosis and, if these symptoms occur, instruct them to discontinue metformin hydrochloride tablets and report these symptoms to their healthcare provider. O Before initiating metformin hydrochloride tablets, obtain an estimated glomerular filtration rate (eGFR). O Obtain an eGFR at least annually in all patients taking metformin hydrochloride tablets. In patients at risk for the development of renal impairment (e.g., the elderly), renal function should be assessed more frequently. 2, assess the benefit and risk ofcontinuing therapy. 2 ; in patients with a history of hepatic impairment, alcoholism or heart failure; or in patients who will be administered intra-arterial iodinated contrast. Re-evaluate eGFR 48 hours after the imaging procedure, and restart metformin hydrochloride tablets if renal function is stable. Surgery and other procedures — Withholding of food and fluids during surgical or other procedures may increase the risk for volume depletion, hypotension, and renal impairment. 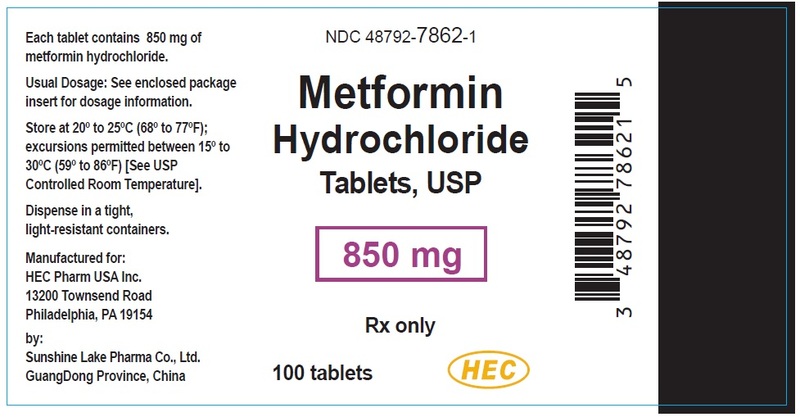 Metformin hydrochloride tablets should be temporarily discontinued while patients have restricted food and fluid intake.Hypoxic states — Several of the postmarketing cases of metformin-associated lactic acidosis occurred in the setting of acute congestive heart failure (particularly when accompanied by hypoperfusion and hypoxemia). Cardiovascular collapse (shock), acute myocardial infarction, sepsis, and other conditions associated with hypoxemia have been associated with lactic acidosis and may cause prerenal azotemia. When such an event occurs, discontinue metformin hydrochloride tablets.Excessive alcohol intake — Alcohol potentiates the effect of metformin on lactate metabolism. Patients should be warned against excessive alcohol intake while receiving metformin hydrochloride tablets.Hepatic impairment — Patients with hepatic impairment have developed cases of metformin-associated lactic acidosis. This may be due to impaired lactate clearance resulting in higher lactate blood levels. Therefore, avoid use of metformin hydrochloride tablets in patients with clinical or laboratory evidence of hepatic disease. There have been no clinical studies establishing conclusive evidence of macrovascular risk reduction with metformin hydrochloride tablets. Because clinical trials are conducted under widely varying conditions, adverse reaction rates observed in the clinical trials of a drug cannot be directly compared to rates in the clinical trials of another drug and may not reflect the rates observed in practice.In a U.S. clinical trial of metformin hydrochloride tablets in patients with type 2 diabetes mellitus, a total of 141 patients received metformin hydrochloride tablets up to 2,550 mg per day. Adverse reactions reported in greater than 5% of metformin hydrochloride tablets treated patients and that were more common than in placebo-treated patients, are listed in Table 1. Table 1: Adverse Reactions from a Clinical Trial of Metformin Hydrochloride Tablets Occurring >5% and More Common than Placebo in Patients with Type 2 Diabetes Mellitus Metformin hydrochloride tablets(n=141)Placebo(n=145)Diarrhea 53% 12%Nausea/Vomiting 26% 8%Flatulence 12% 6%Asthenia 9% 6%Indigestion 7% 4%Abdominal Discomfort 6% 5%Headache 6% 5%Diarrhea led to discontinuation of metformin hydrochloride tablets in 6% of patients. Additionally, the following adverse reactions were reported in ≥1% to ≤5% of metformin hydrochloride tablets treated patients and were more commonly reported with metformin hydrochloride tablets than placebo: abnormal stools, hypoglycemia, myalgia, lightheaded, dyspnea, nail disorder, rash, sweating increased, taste disorder, chest discomfort, chills, flu syndrome, flushing, palpitation. 12 levels was observed in approximately 7% of patients. Pediatric PatientsIn clinical trials with metformin hydrochloride tablets in pediatric patients with type 2 diabetes mellitus, the profile of adverse reactions was similar to that observed in adults. The following adverse reactions have been identified during post approval use of metformin. Because these reactions are reported voluntarily from a population of uncertain size, it is not always possible to reliably estimate their frequency or establish a causal relationship to drug exposure. Cholestatic, hepatocellular, and mixed hepatocellular liver injury have been reported with postmarketing use of metformin. Intervention:Consider the benefits and risks of concomitant use with metformin hydrochloride tablets.Examples:Ranolazine, vandetanib, dolutegravir, and cimetidine.AlcoholClinical Impact:Alcohol is known to potentiate the effect of metformin on lactate metabolism.Intervention:Warn patients against excessive alcohol intake while receiving metformin hydrochloride tablets. Insulin Secretagogues or InsulinClinical Impact:Coadministration of metformin hydrochloride tablets with an insulin secretagogue (e.g., sulfonylurea) or insulin may increase the risk of hypoglycemia. Intervention:Patients receiving an insulin secretagogue or insulin may require lower doses of the insulin secretagogue or insulin.Drugs Affecting Glycemic ControlClinical Impact:Certain drugs tend to produce hyperglycemia and may lead to loss of glycemic control.Intervention:When such drugs are administered to a patient receiving metformin hydrochloride tablets, observe the patient closely for loss of blood glucose control. When such drugs are withdrawn from a patient receiving metformin hydrochloride tablets, observe the patient closely for hypoglycemia.Examples:Thiazides and other diuretics, corticosteroids, phenothiazines, thyroid products, estrogens, oral contraceptives, phenytoin, nicotinic acid, sympathomimetics, calcium channel blockers, and isoniazid. The estimated background risk of major birth defects is 6–10% in women with pre-gestational diabetes mellitus with an HbA1C >7 and has been reported to be as high as 20–25% in women with a HbA1C >10. The estimated background risk of miscarriage for the indicated population is unknown. In the U.S. general population, the estimated background risk of major birth defects and miscarriage in clinically recognized pregnancies is 2–4% and 15–20%, respectively.Clinical ConsiderationsDisease-associated maternal and/or embryo/fetal riskPoorly-controlled diabetes mellitus in pregnancy increases the maternal risk for diabetic ketoacidosis, pre-eclampsia, spontaneous abortions, preterm delivery, stillbirth and delivery complications. Poorly controlled diabetes mellitus increases the fetal risk for major birth defects, stillbirth, and macrosomia related morbidity. DataHuman DataPublished data from post-marketing studies have not reported a clear association with metformin and major birth defects, miscarriage, or adverse maternal or fetal outcomes when metformin was used during pregnancy. However, these studies cannot definitely establish the absence of any metformin-associated risk because of methodological limitations, including small sample size and inconsistent comparator groups. Animal DataMetformin hydrochloride did not adversely affect development outcomes when administered to pregnant rats and rabbits at doses up to 600 mg/kg/day. This represents an exposure of about 2 and 5 times a 2,550 mg clinical dose based on body surface area comparisons for rats and rabbits, respectively. Determination of fetal concentrations demonstrated a partial placental barrier to metformin. Data]. However, there is insufficient information to determine the effects of metformin on the breastfed infant and no available information on the effects of metformin on milk production. Therefore, the developmental and health benefits of breastfeeding should be considered along with the mother’s clinical need for metformin hydrochloride tablets and any potential adverse effects on the breastfed child from metformin hydrochloride tablets or from the underlying maternal condition. DataPublished clinical lactation studies report that metformin is present in human milk which resulted in infant doses approximately 0.11% to 1% of the maternal weight-adjusted dosage and a milk/plasma ratio ranging between 0.13 and 1. However, the studies were not designed to definitely establish the risk of use of metformin during lactation because of small sample size and limited adverse event data collected in infants. Discuss the potential for unintended pregnancy with premenopausal women as therapy with metformin hydrochloride tablets may result in ovulation in some anovulatory women. The safety and effectiveness of metformin hydrochloride tablets for the treatment of type 2 diabetes mellitus have been established in pediatric patients 10 to 16 years old. Safety and effectiveness of metformin hydrochloride tablets have not been established in pediatric patients less than 10 years old. Warnings and Precautions (5.1)]. Metformin is dialyzable with a clearance of up to 170 mL/min under good hemodynamic conditions. Therefore, hemodialysis may be useful for removal of accumulated drug from patients in whom metformin overdosage is suspected. a of metformin is 12.4. The pH of a 1% aqueous solution of metformin hydrochloride is 6.68. Metformin Hydrochloride Tablets, USP contain 500 mg, 850 mg, or 1,000 mg of metformin hydrochloride, which is equivalent to 389.93 mg, 662.88 mg, 779.86 mg metformin base, respectively. Each tablet contains the inactive ingredients povidone and magnesium stearate. In addition, the coating for the 500 mg, 850 mg and 1,000 mg tablets contains hypromellose, titanium dioxide and polyethylene glycol. Metformin is an antihyperglycemic agent which improves glucose tolerance in patients with type 2 diabetes mellitus, lowering both basal and postprandial plasma glucose. Metformin decreases hepatic glucose production, decreases intestinal absorption of glucose, and improves insulin sensitivity by increasing peripheral glucose uptake and utilization. With metformin therapy, insulin secretion remains unchanged while fasting insulin levels and day-long plasma insulin response may decrease. AbsorptionThe absolute bioavailability of a metformin hydrochloride tablets 500 mg tablet given under fasting conditions is approximately 50% to 60%. Studies using single oral doses of metformin hydrochloride tablets 500 to 1,500 mg and 850 to 2,550 mg, indicate that there is a lack of dose proportionality with increasing doses, which is due to decreased absorption rather than an alteration in elimination. At usual clinical doses and dosing schedules of metformin hydrochloride tablets, steady state plasma concentrations of metformin are reached within 24 to 48 hours and are generally <1 mcg/mL. max) following administration of a single 850 mg tablet of metformin hydrochloride tablets with food, compared to the same tablet strength administered fasting. DistributionThe apparent volume of distribution (V/F) of metformin following single oral doses of metformin hydrochloride tablets 850 mg averaged 654 ± 358 L. Metformin is negligibly bound to plasma proteins. Metformin partitions into erythrocytes, most likely as a function of time. Intravenous single-dose studies in normal subjects demonstrate that metformin is excreted unchanged in the urine and does not undergo hepatic metabolism (no metabolites have been identified in humans) nor biliary excretion. EliminationRenal clearance (see Table 4) is approximately 3.5 times greater than creatinine clearance, which indicates that tubular secretion is the major route of metformin elimination. Following oral administration, approximately 90% of the absorbed drug is eliminated via the renal route within the first 24 hours, with a plasma elimination half-life of approximately 6.2 hours. In blood, the elimination half-life is approximately 17.6 hours, suggesting that the erythrocyte mass may be a compartment of distribution. max and AUC differed less than 5% between pediatric type 2 diabetic patients (12-16 years of age) and gender- and weight-matched healthy adults (20-45 years of age), all with normal renal function. GenderMetformin pharmacokinetic parameters did not differ significantly between normal subjects and patients with type 2 diabetes mellitus when analyzed according to gender (males=19, females=16). RaceNo studies of metformin pharmacokinetic parameters according to race have been performed. Long-term carcinogenicity studies have been performed in rats (dosing duration of 104 weeks) and mice (dosing duration of 91 weeks) at doses up to and including 900 mg/kg/day and 1,500 mg/kg/day, respectively. These doses are both approximately 3 times the maximum recommended human daily dose of 2,550 mg based on body surface area comparisons. No evidence of carcinogenicity with metformin was found in either male or female mice. Similarly, there was no tumorigenic potential observed with metformin in male rats. There was, however, an increased incidence of benign stromal uterine polyps in female rats treated with 900 mg/kg/day.There was no evidence of a mutagenic potential of metformin in the following in vitro tests: Ames test (S. typhimurium), gene mutation test (mouse lymphoma cells), or chromosomal aberrations test (human lymphocytes). Results in the in vivo mouse micronucleus test were also negative.Fertility of male or female rats was unaffected by metformin when administered at doses as high as 600 mg/kg/day, which is approximately 2 times the maximum recommended human daily dose of 2,550 mg based on body surface area comparisons. Table 12: Metformin Hydrochloride Tablets, USP Available Strengths, Units, and Appearance 500 mg Bottles of 100 NDC 48792-7863-1 white or almost white round film-coated tablets, debossed "L34" on one side and blank on the other side. 850 mgBottles of 100 NDC 48792-7862-1 white or almost white capsular film-coated tablets, debossed "S99" on one side and blank on the other side. 1,000 mg Bottles of 100 NDC 48792-7861-1 white or almost white capsular film-coated tablets, debossed "S98" on one side and blank on the other side, and scored the bisect line on both sides. Store at 20° to 25° C (68° to 77° F); excursions permitted between 15° to 30° C (59° to 86° F) [See USP Controlled Room Temperature].